The Southfield Non-Profit Housing Corporation was founded in Michigan on January 24, 1973 by a group of industrious, innovative, forward-thinking individuals who were passionate about the care and safety of seniors. The founding members of the organization included Ernest E. Beren, Francis J. Fodale, John Kennedy, Marvin Kramer, and Gilbert B. Silverman. Named for the city they loved, the SNHC began their quest to develop quality, affordable senior housing in Southfield. The units would be brand new, include multi-family housing, and most importantly they would be a place that residents would be proud to call home. In 1977 under the leadership of former SNHC Board Member Gilbert B. Silverman, highly regarded in the field of multifamily housing, a brand new 162-unit senior apartment development was opened at 24400 Civic Center Drive. The building was named the McDonnell Tower Apartments. Shortly thereafter, two additional senior housing properties were developed including River Park Place Apartments and Townhomes, a 182-unit facility with 62 additional family townhomes at 24300 Civic Center Drive; and Woodridge Apartments, a 98-unit facility at 25325 Grodan Drive. Day-to-day operations of all SNHC properties are managed by an independent management company. 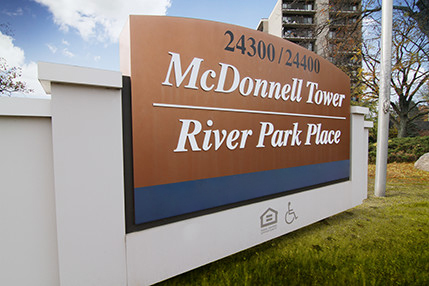 As part of SNHC’s continued commitment to provide desirable quality, modern, energy efficient, affordable housing to residents, board members commissioned a project needs assessment for McDonnell Tower and River Park Place Apartments and Townhomes. As a result of that assessment, the board agreed that many upgrades were needed to preserve the properties. They developed a strategy to address each building’s interior and exterior renovation needs. The plan included significant energy efficiency upgrades to lower resident’s monthly utility costs, and reduce each building’s carbon footprint in the community. On December 2014, a new development agreement was entered between SNHC and Larc Community Development Group to complete the improvement projects. Renovations on McDonnell Tower Apartments and River Park Place Apartments and Townhomes is projected to be completed in late spring of 2016. New projects will be completed by late fall 2016. SNHC remains committed to building quality communities and preserving access to affordable housing in that community. To that end, safe, clean, quality rental housing units are available to seniors, the disabled, and families who meet income eligibility requirements.